DAKAR, SENEGAL—Sixty-three percent of disputes related to private sector land and natural resource investments in Africa began when communities were forced to leave their lands, according to new research released today by TMP Systems and the Rights and Resources Initiative. The research also found that areas targeted for development in Africa are more heavily populated than similar developments elsewhere in the world. The population density within a 50- kilometer radius of disputed projects in Africa was more than twice the global average: 816,547 people compared with 319,426 globally. For West Africa, the average was over 1 million people. In an area with a history of social conflict. The suite of reports explores investment-based conflicts in East, West and Southern Africa, and compares them to similar conflicts around the world. They were released at a panel event in Dakar alongside RRI’s Annual Review of the global state of land and resource rights, which found that development finance institutions have emerged as potential leaders in the land rights arena given their significant leverage over investments in the developing world. While a number of high profile corporations have also pledged to both prevent deforestation and respect human rights, implementation of these commitments is slow at best, given complex supply chains and local suppliers whose reputations are less exposed. 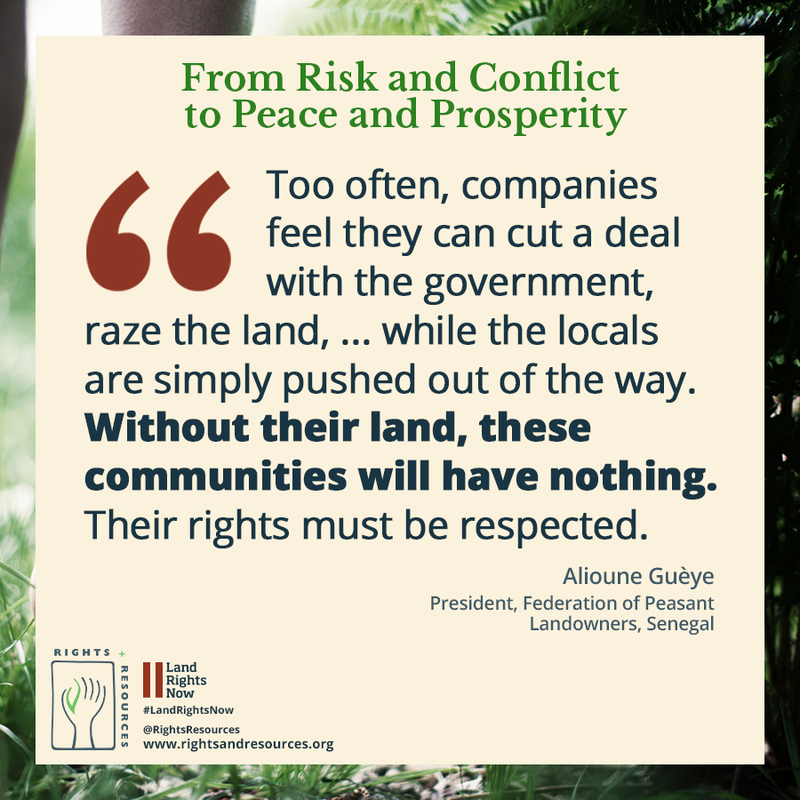 Despite the growing number of economic actors that accept the market rationale for respecting community land tenure, rights violations are still commonplace. In West Africa, plantation agriculture—especially palm oil projects—drive a majority of disputes. Community displacement was the primary driver of 70 percent of the tenure disputes examined, while issues related to compensation were the primary driver for 30 percent. Sixty percent of the tenure disputes resulted in work stoppages, which impact companies’ and investors’ profits, and 30 percent resulted in violence. Munden noted that the Fanaye biofuel plantation project on Senegal’s northwest border was implemented without the consent of local communities. In one case, violent protests in Fanaye Dieri led to the death of two community members and compelled the government to revoke the concession and move it 30 kilometers to the east, to the Ndiael Nature Reserve. But the new location cut off local cattle farmers from their grazing lands, triggering additional conflict. After six years, the concession currently uses only 1,500 hectares out of the 20,000 allocated by the government. Infrastructure and public utilities are driving a majority of the disputes in East Africa, and communities have made use of stronger legal frameworks to bring lawsuits against companies that violate their rights. Community displacement was the primary driver of 36 percent of the tenure disputes examined, while compensation was the primary driver for 27 percent. Seventy-three percent of the tenure disputes resulted in work stoppages, yet only 27 percent resulted in violence. A wind farm in Kinangop was cancelled after a protracted legal battle and a massive protest that destroyed a wind mast. The developers are now suing the Kenyan government, seeking compensation for their losses. A flagship project at Lake Turkana has been delayed for a decade due to an ongoing legal challenge from nomadic pastoral communities. Four communities are seeking redress because their lands were taken without consent. In Kajiado County, landowners are mounting legal opposition to the Kipeto project whose buffer zone—half a kilometer wide—included much of their lands. In Southern Africa, sugar plantations and mining developments are driving a majority of the disputes and, without strong legal frameworks for communities to assert their rights, significant violence has resulted. Community displacement was the primary driver of 82 percent of the tenure disputes examined. Issues relating to compensation were never the primary driver, showing that companies could not buy their way out of disputes. Seventy-three percent of the tenure disputes resulted in work stoppages, and 73 percent triggered violence—the highest rate of violence in the world. While a number of major buyers and producers who dominate supply chains in the sugar sector have made commitments on land tenure, efforts to clean up their supply chains have been plagued by issues of transparency and lack of local engagement. In Madagascar, a sugar plantation that had operated without conflict since 1984 became the site of local resistance in 2005 after the project owners, Complant and Sucoma, attempted to reroute an irrigation system, which would have flooded lands belonging to local communities. Over the next several years, through 2014, strikes, riots and work stoppages ensued— indicating that even seemingly successful projects can become mired in conflict and work stoppages if local tenure rights are not respected throughout project implementation. Representatives from four national land commissions—Ghana, Kenya, Liberia and Senegal— attended the Dakar event to report on the status of land rights and ongoing tenure reforms in their countries and respond to the report’s findings. These commissions have played a helpful role in channeling efforts for governments exploring comprehensive reform. One such example is in Senegal, where they established an inclusive process for the drafting of the land policy that is now being reviewed by the president’s office. 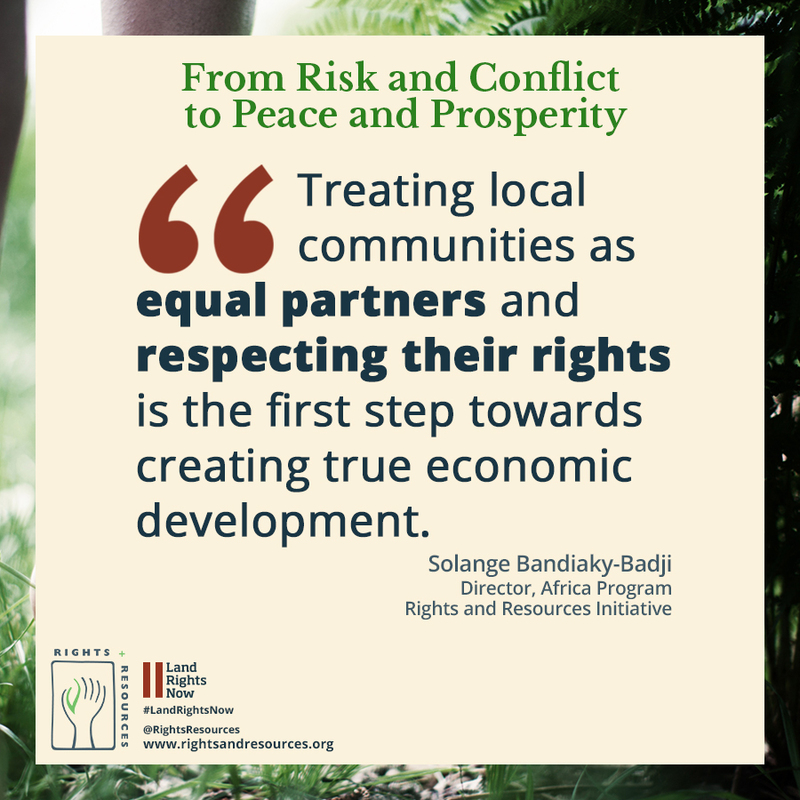 “Economic developments that fail to benefit local communities have little to zero value because of the conflicts they generate,” said Solange Bandiaky-Badji, RRI’s program director for Africa.